With 29 lakh vacancies, how useful is 10% reservation if Centre, states haven't hired in years? Over 13 lakh vacancies are in the education sector, which includes 9 lakh in elementary teachers and 4.17 lakh unfilled positions under Sarva Shiksha Abhiyan. 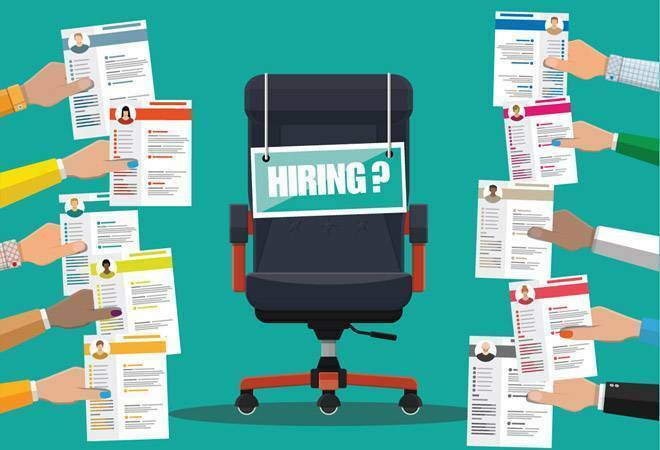 With Lok Sabha passing the Constitutional Amendment Bill to grant 10 per cent reservation in government jobs, the next move ought to be the filling of existing job vacancies at the Centre and states. But that's easier said than done. Over 29 lakh posts are lying vacant with the central and state governments, data compiled by BusinessToday. In from parliamentary questions reveals. The government has an opportunity to put the new reservation quota to provide a living to 3 lakh jobless general category individuals immediately. At least on the electoral front, this move may turn out to be a master stroke given that Upper caste backlash cost BJP the state assembly elections. But can it? Especially, since lakhs of vacancies have not been filled for years. Over 13 lakh vacancies are in the education sector, which includes 9 lakh in elementary teachers and 4.17 lakh unfilled positions under Sarva Shiksha Abhiyan (Education for All), a programme aimed at the universalisation of elementary education in a time bound manner. Another 1 lakh posts of secondary level teachers is also lying vacant. Kendriya Vidyalayas, alone have a shortfall of 7,885 teachers as of August 2018. There are 4.43 lakh vacant posts lying with the police. Moreover, Central Armed Police Forces (CAPFs) and Assam Rifles (AR) have 61,578 vacant posts as on August 2018. The numbers of vacant posts in various ministries and departments of government of India are 4.12 lakh out of total sanctioned strength of 36.3 lakh. There are 2.53 lakh permanent posts lying vacant in railways. Currently, there are about 17 per cent vacancies in non-gazetted cadre. The answer also considers shortfall in railway staff to be one of the reason which affect the punctuality of Indian Railways. Out of the 14 lakh posts for the Anganwadi Workers (AWWs) and 12.83 lakh posts for the Anganwadi Helpers (AWHs) sanctioned by the Government of India to all the States/UTs, 1.06 lakh posts of AWWs and 1.16 lakh posts of AWHs are lying vacant. Various important and high level government jobs such as IAS (Indian administrative services), IPS (Indian police Services) and IFS (Indian forest services) have 1449, 970, 30 vacancies respectively. Indian Courts are also short on staff. Supreme Court has 9 vacant judge positions (29 per cent of sanctioned positions), high courts have 417 (38 per cent of sanctioned positions), and subordinate courts have 5436 vacant judge positions representing 24 per cent of the total sanctioned strength. Meanwhile, AIIMS (All India Institutes of Medical Sciences) Delhi has a shortage of 304 faculty members representing 30 per cent of the sanctioned strength. The non-faculty staff of AIIMS (all cities) has a massive 75 per cent shortfall in sanctioned staff. Premier institutes such as IITs, IIMs, and NITs have a shortfall in faculty of 2,612, 191 and 3,552 respectively. 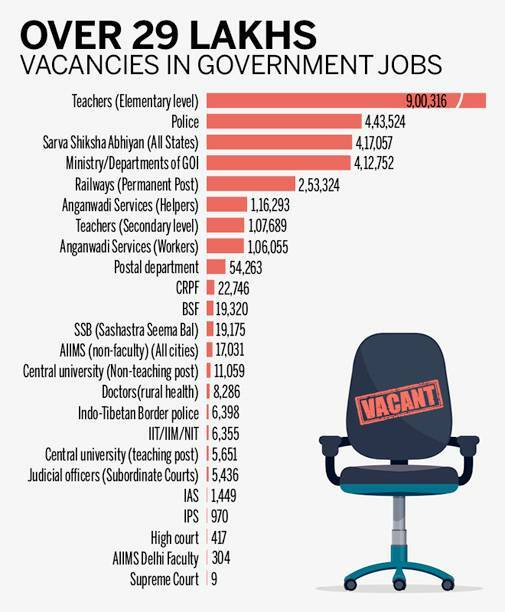 But, the filling up of these vacancies is likely to add to the government expenditure. The finances of government are in bad shape. Centre is spending close to Rs 1.68 Lakh crore in salaries in current fiscal year. Pension expenditure by the government has overtaken salaries expenditure by Rs 10,000 crore in 2018 (according to Medium Term Expenditure Framework, tabled in the Lok Sabha). At the state level, the total budget goes to pay the salaries of employees ranges from as low as 12% in Bihar and Uttar Pradesh, to a reasonably high of 26% in Kerala, 25% in Rajasthan and close to 30% in special category states like Uttarakhand, Jammu and Kashmir and Assam. One of the richest states, Maharashtra has 57.5 per cent of 2018-19 budget going into paying salaries, pension and interest payments, up from 54.87 per cent in the previous year. In defence sector, for instance, close to half of the defence budget is already spent on salaries and pensions. The salaries are one of the critical components of budget expenditure.